A4 Mounted 7.0 x 10.5 in. (177 x 267 mm) 11 x 14 in. MEDIUM 12.4 x 18.6 in. (315 x 472 mm) 16 x 24 in. White Tara (Skt. Sita Tara: Tib. Drol-dkar) is the long-life aspect of the female saviouress Tara, the most popular Buddhist goddess of mercy and compassion. In her white longevity aspect she is also known as Saptalocana Tara, or 'seven-eyed' Tara, and as an important yidam or meditational deity in her own right she is know as 'Wish-fulfilling Wheel White Tara' (Skt. Chinta-chakra sita Tara), which is the form in which she appears here. As one of the three principal Buddhist longevity deities White Tara also frequently appears in a trinity with Amitayus and Ushnishavijaya. Her meditational practices are mainly employed to confer long-life, alleviate illnesses, and to remove the obstacles that are indicative of an untimely death. Thangkas of White Tara and the 'Trinity of Long-Life Deities' are frequently commissioned for such purposes, or to auger an auspicious rebirth for a deceased relative or friend. White Tara sits in vajra-posture upon a white moon disc and an immaculate white lotus with a hundred or a thousand petals. She is graceful, beautiful and as youthful as a sixteen-year-old, with full breasts, a narrow waist, and a sweetly smiling face. Her complexion is radiant and white like a full autumnal moon, with scintillating rays of golden light emanating from her body against the aureole disc of the full moon that appears behind her back, which itself radiates cool beams of pure light throughout the ten directions. Her divine form is adorned with seven bow-shaped eyes, with the three eyes of her face representing the perfection of her body, speech and mind, and the four eyes in her palms and soles representing the 'four immeasurables' of her boundless compassion, loving kindness, sympathetic joy, and perfect equanimity. With her lowered right hand she makes the boon-granting varada-mudra of supreme generosity. And with her left hand she makes the abhaya-mudra of protection or granting refuge, whilst holding the stem of an immaculate blue utpala lotus blossom in front of her heart. She wears the five divine silk garment of a sambhogakaya goddess, and the eight golden ornaments of: earrings; a belt; bracelets, armlets and anklets; and short, medium and long necklaces. Half of her long sapphire-black hair is bound up into a topknot, while the other half hangs freely about her shoulders. Her golden tiara is adorned with divine flowers and jewels, and on the crown of her head is the small image of red Amitabha Buddha, the 'Lord of the Padma or Lotus Family' to which White Tara belongs. 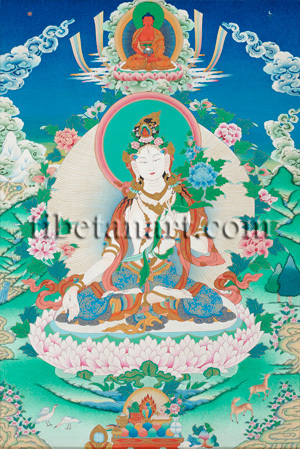 Amitabha Buddha also appears amidst the clouds and rainbows directly above White Tara's halo, as he sits in vajra-posture upon his moon disc and lotus. Amitabha wears the three orange-red robes of a Buddhist monk, and with his two hands joined upon his lap in meditative equipoise he holds a blue alms-bowl. A fragrant canopy of delicate flowers and leaves encircles Tara's luminous full-moon aura, and the natural background landscape of this composition is beautifully rendered with billowing clouds, hills, snow peaks, cliffs and rock formations, flowers and trees, a lake and waterfalls, and the longevity and fidelity symbols of paired cranes and deer. At the bottom centre is a small table that contains various offerings: such as jewels; a golden incense burner; a longevity vase sealed with a wish-granting tree; a nectar vase; a silken divination arrow; a blazing eight-faceted gem; a bowl of white mustard seed; a torma or sacrificial cake, and flowers in a crystal vase. At the sides of the table appear the five objects that delight the senses: a mirror (sight), cymbals (sound), a silk cloth (touch), a conch shell full of perfume (smell), and three delicious fruits (taste).